The best way to get started or get answers to your questions,... is to call! Discounted postage varies based on the quality of the addresses in the list and the geographical density of the list. 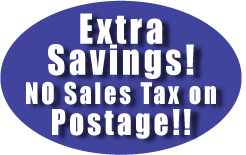 Also, an extra discount applies to mail we deliver to the South Jersey or Philadelphia, for mail pieces which have South Jersey or Philadelphia addresses. The postage calculated above is only an estimate. We need the final mailing list to determine the postage exactly. Occupant lists include all addresses in a geographical area, usually defined by zip codes and carrier routes within the zip code. Mail Service includes CASS certification of addresses, removing undeliverable records and duplicates, pre-sorting the list, ink jet printing of address on mail piece, sorting and packaging mail piece per USPS requirements and delivery of mail to the Bellmawr NJ main Post Office. We will need your mailing list in an computer file. We can handle almost any format, most customers prefer to provide the list in an Excel spreadsheet format. You can email it to us when you are ready. There is no extra charge for using your list, unless the list needs re-structuring/repairs to make it usable. Need help on preparing your mailing list? After downloading open the file with Excel.